Deadly Harvest is book number four in a series of crime fiction/mystery novels to feature Detective David "Kubu" Bengu, who works for the Botswana police force. Normally I begin with the first installment of a series, but I didn't realize that this book was so far ahead. As it turns out, its placement in the series wasn't an issue at all -- in fact, it can easily be read as a standalone, without any prior knowledge of the characters or the setting necessary. So if you're considering it, and you haven't read the others, no problem. The author, Michael Stanley, is actually a composite of two people: Stanley Trollip and Michael Sears, both born in Johannesburg, South Africa. Two little girls go missing in two different locations, and when their loved ones turn to their local police forces, little to nothing happens. Soon the cases go cold, at least officially, but one father named Witness can't stop thinking about his daughter. His grief leads him to the local bar where he spends a great deal of time drinking; and then to a local witch doctor who tells him that his daughter may have been taken for muti. Normally extracted from plants or sometimes animals, the belief is that if a person ingests this traditional substance, he or she will take on some of the powers of the plant/animal being used (like a lion heart for bravery, etc.). However, there is also a market (illegal and definitely unsanctioned) for muti derived from humans. Witness comes to believe that his daughter is a victim of this illegal muti trade, and he is told he should look for a man seeking power. This advice makes Witness remember seeing candidate Marumo about the time of his daughter's disappearance, a member of the opposition Freedom Party in an upcoming election. Witness goes to Marumo's home in the dark of night, kills him and flees. Don't worry -- not a spoiler -- this bit of information is right on the cover blurb. Kubu is assigned to the case, an investigation where he will have to tread extremely lightly due to political considerations. As it happens, a new detective, Samantha Khama is working on her first case which deals with of one of the missing girls. Their individual investigations merge together when a gourd filled with muti is found in Marumo's desk and ultimately reveal a unknown, deadly and "invisible" adversary who needs to be stopped. Help, however, is not fast in coming -- their unidentified suspect is very powerful and no one will speak against him. The mysteries within this police procedural are engaging, but even more so are the social and political issues that are brought out here. As I've noted previously in other posts, crime fiction is becoming a medium for the airing of important issues, especially in countries with which most people are unfamiliar. The discussion of prejudice against albinos, for example, and their value in Tanzania as a source of muti that breeds fear among that group of people goes way beyond the police procedural aspect, as does the line between traditional beliefs and modern viewpoints, a boundary which is often straddled by those on both sides. It's also interesting that some things seem to be universal -- the politics involved in police work, the lack of enough police to adequately investigate crimes in smaller areas, the concern about AIDS and the plight of children born of mothers who've died from the disease, corruption etc. Of course, this isn't why most people tend to read crime fiction, but these authors have done a great job in introducing the issues important in this area. The main character, Detective David "Kubu" Bengu (known as Detective Kubu throughout) is described as having a great bulk. Even so, he speaks softly, has a rational mind, and never fails to direct respect where it is due even under trying situations. He is a family-oriented man as well as a good investigator. His new colleague, Samantha Khama, hasn't yet learned the fine art of tempering her very hot temper, becoming passionate about issues that are important to her not only as a cop, but as a woman and as a human being. Both characters are drawn very well. On the other hand, there is a really large amount of space spent on Kubu's personal life -- with his father's declining mind, the decision whether or not to adopt a little girl whose mother died of AIDS, Sunday family traditions, games played with his little girls, etc., and while I'm sure this all adds to character development, it's often distracting in terms of the mystery and the action at the heart of the novel. I also have to say that despite all of the careful plotting and the focus on the investigation, I guessed who the "invisible" adversary was not too far into the story. This is a personal thing, but when I read crime, I want that "aha" moment at the end when all is revealed. Finally, I'm not feeling an overall entrenched sense of place in this novel which to me is important and especially so in a place I've never been. On the flip side, however, this is a series I would like to read from its beginning, so I will definitely be revisiting Detective Kubu in the future. Overall, it's a fun read that is remarkable in terms of the authors' attention to pressing social and political issues and how the characters react in such situations. As I noted, not everyone looks to a crime novel for what it can say about another country or another culture, so if you're in it just for the mystery aspect of it all, you probably won't be disappointed. 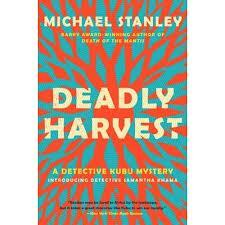 Deadly Harvest is a book I can recommend to other readers of crime fiction/mystery, despite my personal little niggles.